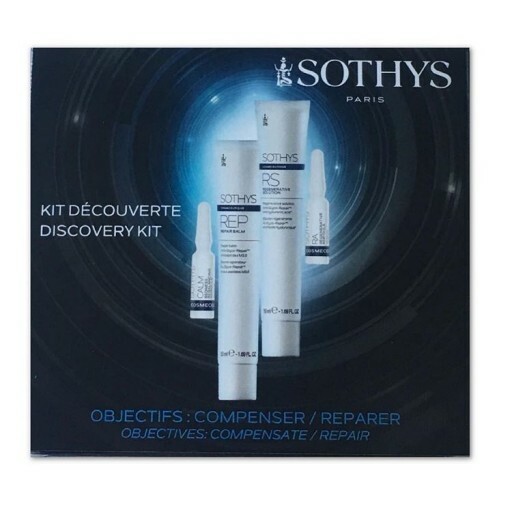 Trial sizes to try before buying full retail sizes, Responding to all skin problems in a targeted way, offering complete sophisticated programes and new concepts for more and more effectiveness, benefits and well-being, To accompany skin that has been temporarily weakened by any type of aesthetic procedure before returning to the usual beauty routine. Regenerative Solution: Aqua (Water), Glycerin, Buty-lene glycol, Dimethicone, Hydroxyethyl urea, PEG-8, Ammonium acryloyldimethyl-taurate/VP copolymer, Cucumis sativus (Cucumber) fruit water, Panthenol, Propylene glycol, Allantoin, Sodium hyaluronate, Ceratonia siliqua (Carob) fruit extract, Disodium EDTA, Sodium dehydroacetate, Citric acid, Chlorhexidine digluconate, Phen-oxyethanol, Ethylhexylglycerin. Repair Balm: Aqua (Water), Bulyrospermorri parkii (Shea) oil, Glycerin, Butyrospermum parkii (Shea) butter, Dicapryly1 carbonate, Cetearyl alcohol, Caprylic/ capric triglyceride, Tapioca starch, Butylene glyco' Glyceryl stearate, PEG-100 stearate, Ceteareth-33, Hydroxyethyl acrylate/sodium acryloyldi-methyl taurate copolymer, Panthenol, Propylene glycol, Lecithin, Squalane, Allantoin, Disociium EDTA, Sodium dehy-droacetate, Xanthan gum, Peumus boldus leaf extract, Pentylene glycol, Ceratonia siliqua (Carob) fruit extract, Sodium styrene/acrylates copolymer, Polysorbate 60, Tocopherol, Citric acid, Glycine soja (Soybean) oil, Laminaria ochroleuca extract, Chlorhexidine digluconate, Polymethylsilsesquioxane, Carbomer, Sorbitan isos-tearate, Sodium lactate, Helianthus annuus (Sunflower) seed oil, Potassium sorbate, Phenoxyethanol, Polysorbate 20, Ethylhexylglycerin, Rosmarinus officinalis (Rosemary) leaf extract, Palmitoyl tripeptide-1, Palmitoyl tetrapeptide-7. CALM Redness Rebalancing Ampoules: Aqua (Water), Butylene glycol, Panthenol, Propylene glycol, Hexylen2. glycol, Capryloyl glycine, Sodium dehydroacetate, Sodium hyaluronate, Sodium dextran sulfate, Saccharomyces cerevisiae extract, Peumus boldus leaf extract, Pentylene glycol, Tetrasodium EDTA, Citric acid, Xanthan gum, Xylitylglucoside, Sodium citrate, Phragmites communis extract, Poria extract, Phenoxyethanol, Sodium benzoate, Ethylhexylglycerin. RA Regenerative Ampoules: Aqua (ViJer), PEG-8, Glycerin, Butylene glycol, Hexylene glycol, Capryloyl glyane, Sodium dehydroacetate, Tetrasodium Ceratonia siliqua (Carob) EDTA, fruit Citric acid, Xylitylgiucoside, extract, Phenoxyethanol, Glyceryl acrylate/acrylic acid copolymer, PVM/MA copolymer, Ethylhexylglycerin, Dextran, Tripeptide-1. Apply Regenerative Solution to clean skin to targeted zones on the face and body. Follow with the suitable cream. May be used as a mask (leave on for 10 min, absorb excess or rinse). Apply Repair Balm morning and evening to the face and neck or to targeted zones on the body. Apply CALM ampoules morning and evening to the parts of the face and body that present redness. Follow with the suitable cream. Apply Regenerative Ampoules morning and evening. Apply half the contents of one ampoule to the areas requiring regeneration (face or body). Follow with a suitable cream.